As municipalities begin to tackle the problem of free-roaming cats, we would like to offer some insight and advice. Some municipalities have chosen to allow feral cat colony management (TNR) in the hopes of saving money. Unfortunately, the decision to do so can have consequences for the environment, native wildlife, public health and welfare, and in the long run, result in the failure of reducing the numbers of free-roaming cats in neighborhoods. There are many issues to consider. Does the municipality have cat licensing? Required and up-to-date vaccinations for cats? An anti-roaming law for cats? A limit law? Who is considered to be the legal owner of a cat that is fed daily and provided some makeshift shelter? Who is held accountable should that cat injure someone? What happens when grant money that supports a feral cat management program runs out? What is the priority of this municipality? Is this municipality located in an area that has been designated as critical habitat for wildlife or an IBA (important bird area)? We find that too many municipalities jump on the TNR bandwagon without properly researching all aspects of this issue - especially the effectiveness of TNR. Do not make a decision until all aspects of this issue have been investigated. This is not just about domestic animal welfare. This is about public health and safety, the impact on natural resources, nuisance issues and property rights, and human-wildlife conflict. Directly below are links that provide critical information. Please make an informed decision that does not come at the expense of public health and welfare. Unless more than 75% of the entire population of fertile cats within a municipality is sterilized EVERY year, there will be no reduction through TNR. See this study for details. Reduced intake at shelters and reduced rates of euthanasia do NOT indicate a population reduction or that there are fewer homeless/stray/feral fertile cats roaming the streets. Study published in Nature Communications - The impact of free-ranging domestic cats on wildlife of the United States. Press Release - Catch-and-release of feral cats: Humane treatment or environmental threat? Study published in Journal of Mammalogy - Effects of sterilization on movements of feral cats at a wildlife-urban interface. Please utilize these additional resources below to gain more insight into this issue. Do You Believe She Deserves to Live Inhumanely and Die Tragically Outside Just Because She Acts Wild? (Brochure by TNR Reality Check that presents an overview of the free-roaming cat issue and TNR). The Real Deal. (Flyer by TNR Reality Check stating the five basic problems of TNR). Should We Use Cats As Mousers? Fallacy or Reality? (TNR Reality Check addresses some common myths). Questions for Evaluating a TNR program. (Set of 20 questions to determine if a colony or program has succeeded in reducing the number of feral cats through natural attrition and to evaluate any problems that have arisen as a result of the colony and/or program). A frequent problem at managed cat colonies is the presence of Rabies-vector Species including skunks and raccoons. These animals are often seen feeding alongside the feral cats. Not every cat in a colony can be trapped; therefore not every cat is vaccinated for rabies. Cats are not re-trapped for subsequent vaccinations when initial inoculations expire. Colonies can consist of ferals as well as free-roaming house cats. How is TNR good public health policy? PUBLIC HEALTH OFFICIALS CLICK HERE. 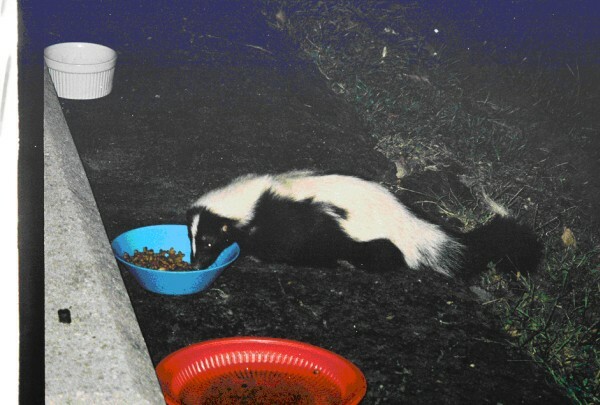 Skunk eating at a "managed" colony.